Living Your Legacy Now - Thompson Law, P.C. I recently had the privilege of visiting with Bernard and Glenda, and they graciously agreed to let me share the story of their awesome summer adventure. Here at Thompson Law, P.C., we love to hear about clients who are really living life! The entire family traveled from all over the country (a group of 18) to spend the week enjoying the Outer Banks in North Carolina. Bernard and Glenda’s grandchildren had the chance to play with their cousins, aunts, and uncles. The family spent their days exploring the beach, feeling the sand beneath their feet, and hearing the ocean waves hit the shore. If they weren’t at the beach, the grandkids were taking full advantage of the swimming pool from the early morning until right before a family supper. Each of Bernie and Glenda’s children hosted one family supper each night of the week; a favorite was the “steamers” pot (a deluxe crab boil). 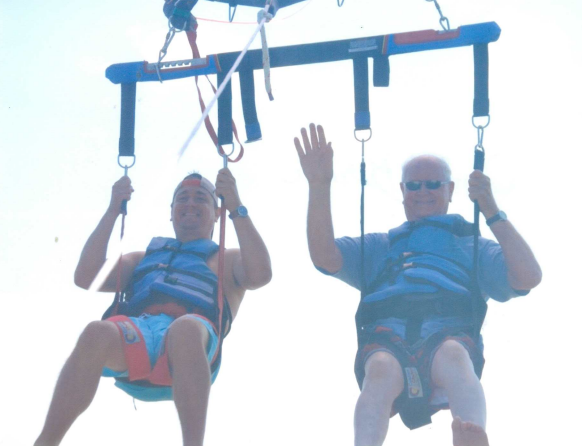 A big highlight of the trip was Bernie parasailing for the first time! He absolutely loved the experience. Go Grandpa! We applaud the Ofstehage family for spending the time and resources to organize an unforgettable week for their children and grandchildren. As we often say at Thompson Law, P.C., the best things in life aren’t things. The experiences that you and your family have together will be the memories that last a lifetime. Do you have an upcoming family trip scheduled? Do you hope to schedule one? We have heard time and again how meaningful the “family trips as adult siblings” have meant to people. Thompson Law, P.C. wants to encourage you to live your legacy now!